Career Teacher with the Anaheim Union High School District, Anaheim, California. He started in the district in September, 1971 and moved to Cypress High School in September, 1995. He retired in 2003 or 2004. Memorial at The Sanctuary Church, at 102 E. Baker St. Costa Mesa, Saturday, August 29, 1 p.m., 2 - 4 pm Food and Fellowship. These first photos are from Carl Morrison, Carl@TrainWeb.com. I met Don when he transferred to Cypress High School in the Anaheim Union High School District in September, 1995. We had a technology committee meeting in my classroom one day soon after he arrived, and he noticed a photo on my classroom wall of a Shay locomotive in the snow. From that moment on, we were friends at CHS and went on many outings to tourist trains, on train rides, to auto museums and other outings of mutual interest. Originally there were 4 of us known as the Royal Order of the Old Geezers Club (OGC). Even during the decade since our retirement, we continued to go on outings together. March 25, 2004. Don's 62nd birthday outing with Rex Harrod, Gary Hess, and Carl Morrison. The photos, above and below, were from a trip Don and I, with Don Roe and Chris Guenzler, took to Nevada Northern Railway's "Steam in Winter" December 4, 2004. The photo below was taken in the cupola of a caboose. Don drove his black Ford Explorer and we had a little snow in the parking lot in Ely, Nevada. It was then that I realized that Don had never driven in snow or ice before. We got him through it unscathed. As I look back at the photos now, I am not sure I have a photo of Don when he looked happier. We were both 62 and near retirement from teaching at the time. Don would attend car shows, taking many photos of cars he wanted to model, and always had triple prints made and would share them at our teachers' lunch table. 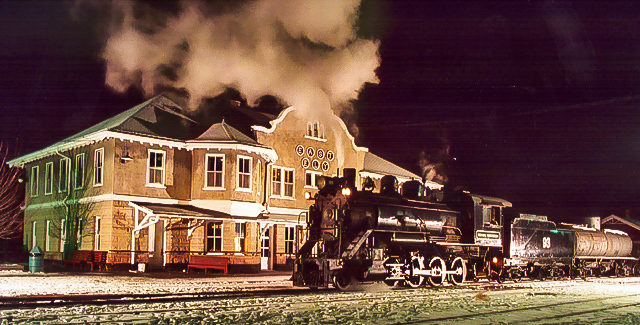 On that December, 2004 trip to Ely, Nevada with Don, they duplicated a historic scene for photographers, above. Don took this photo and I used it with his permission in my report. I froze out and left before they got the lights to work, but Don hung in there and got this excellent photo. Don with our son Matthew, Don Roe, April Roe, Sue Morrison, and me. December 2, 2012. We were headed for a Christmas Pipe Organ Concert at the First Congregational Church in LA. 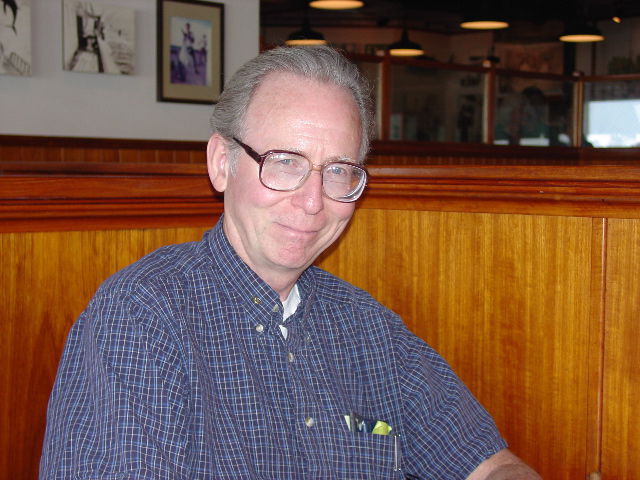 Don loved pipe organ music (as well as classical music) and our son is an organist so Don joined us often for concerts. Matthew was a Missionary to Paraguay for 5 years and Don supported him financially, and of course Don apologized for not giving more. I invited Don on an Amtrak Coast Starlight trip to Seattle when I was on a reporting assignment for TrainWeb.com. That was May 8, 2006. Even though we had some delays, Don always had a book to read or notes to make. Seattle train trip May, 2006. On the Seattle trip in the Pacific Parlour Car, Don with his railroad atlas and his usual cup of tea. May, 2006. On another assignment for TrainWeb.com, the Ringling Bros. and Barnum & Bailey Circus Train, I always get 4 tickets to the circus and one year we took Don on the 4th ticket. July 29, 2011. 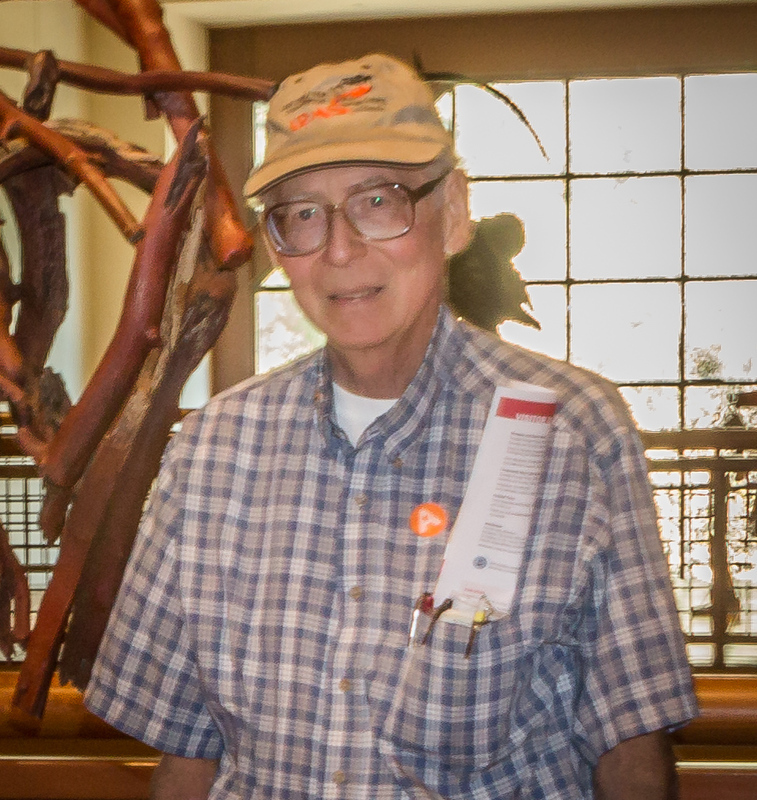 The last outing that Don, Gary, and I went on was to the Autry Musuem in Griffith Park on March 25, 2015 to celebrate Don's 73 birthday. 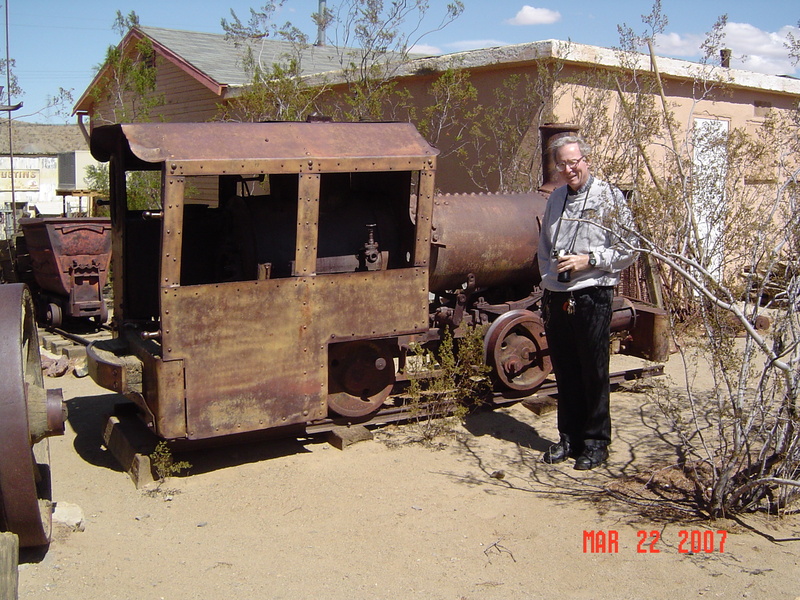 In March, 2007, Don and I ventured up to the old mining town of Randsburg, located on Highway 395 in the Mojave Desert, and found this small steam locomotive. I first met Don in 1982 at John Ackerman's at one of John's Monday night model building gatherings. I was pleased to learn that, in addition to being a model builder, Don was also a train and model railroad enthusiast. Don and I became good friends and would go on various local adventures to car and model shows and to watch trains. 3. Don was an avid member of the Southern California Chapter of the IAAM (Int'l Assoc of Automotive Modeler's). This was taken at a meeting at Schroeder's Speed Shop, Burbank, date UNK. Photographer UNK. For almost 20 years, Don, Wayne, and Gary, along with a periodic few others, would meet at my house on Monday nights to work on models. Sometimes these evenings were relegated to solving problems, reading a ton of monthly magazine that Don would bring over and in general enjoy a variety of treats, including a Polly's pie brought by Don. 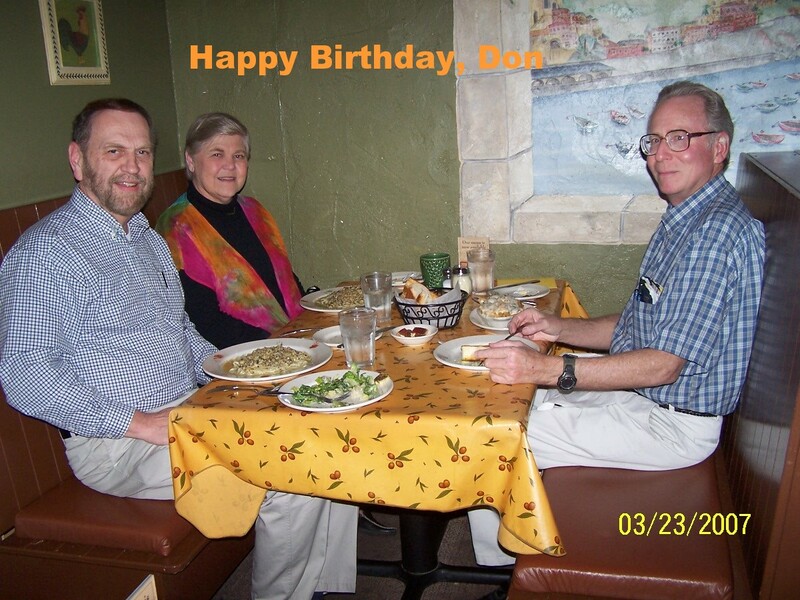 My wife (Jan) and I were celebrating Don’s 65th birthday at Scarantino’s Restaurant in El Toro, CA. The date is March 23, 2007. A good time was had by all. Photo by the waiter. This is a photo of Don (and me in the green shirt) taken at the Muckenthaler Motor Car Festival Concours d’ Elegance held annually in Fullerton, CA. The photo was taken on May 18, 2014 by an acquaintance of Don’s. I don’t remember Don’s friend’s name. I met Don on the first day of 7th grade (61 years ago!). His family had just moved to their home on Vassar Ave. in La Mesa. Our family lived a few blocks away. Cars were a common interest from the beginning and later on we attended car shows whenever possible. Don was a lifelong friend and we always thought of him as a member of our family. Don’s senior year high school yearbook picture. Don (and I) graduated from Helix High School in La Mesa, CA in 1960. Don was an excellent singer and was in the Highlander Choir all through high school. He was also a member of a select group called the Choraliers which specialized in Renaissance era madrigal singing. Don attended and graduated from San Diego State College (it’s now called San Diego State University). I believe Don’s major was Industrial Arts. After graduation and before he started teaching in Anaheim, it was my understanding that Don spent some time in the Peace Corps. Don’s heart valve replacement surgery was at Christmas time [and he stayed in my home during recovery]. Don was Lee’s cousin (my late husband). His Mother, Doris and Lee’s Father, Henry were brother and sister. I met Don when Lee and I were married. He was an usher at our wedding. After my husband died, Don was very helpful to me with my cars and we would keep in touch and catch up on news over lunch & a movie. He was a good friend. Don taught in Camarillo for at least a year before coming to Orange County. I remember us talking about some of his experiences living in a duplex there with his noisy neighbor, when I would be complaining about mine. I'm not sure how much time he was in the Peace Corps. Remember him talking about taking classes in Tagalong. Was always under impression that he never got out of the training phase, never knew the reason. If I remember correctly, I first met Don in late 72-early 73 when he was living in an apartment on Western near Ball Road. Don admiring a Jaguar SS100, one of his favorite cars, at the May 18, 2014 Muckenthaler Concours. This was the last show that we were at together and think it may have been the last time I saw him. Faculty Barbershop Quartet at Cypress High School, 1998. Cypress High School yearbook "mugshot" from the faculty section in 1999. Cypress High School yearbook picture from 2001. The people in the barbershop quartet (3 photos above) were (from left to right) David Crosby – tenor, Robin Orr – bass, Don Drummer – lead, and me (Michael Manning) – baritone. I believe that this is a picture of when we were the opening act of the Cypress High Band’s winter concert held at Cypress College in December 1997. We would practice in Don’s classroom after school and Robin would bring in a portable keyboard to help us learn the songs. We did some traditional barbershop songs, some barbershop songs with our own lyrics, as well as some other four-part vocal songs. One of the barbershop songs with our own lyrics was about our favorite “Tracy” (Principal, Dr. Tracy Brennan) and another was about WASC (Western Association of Schools and Colleges – which is responsible for our school’s accreditation). You can often say in a humorous song things that probably need to be said, but that might otherwise be considered inappropriate. We performed at faculty meetings, WASC meetings, some school music concerts, and an all-district teacher in-service meeting. I have always enjoyed the tight harmonies of barbershop music, and in my humble opinion, we sounded pretty good. In addition to enjoying blending our voices together, we were able to get to know one another better on a personal level. I recall one instance in which we were practicing in our home. We took a break to enjoy one of my wife’s delicious dinners. In the conversation, Don chose to talk about his religious faith. It was more than I had ever heard him say on the topic. It caused me to appreciate him even more. I find consolation in knowing that Don is now in the hands of a loving and just God. Thank you, Don for the good memories. I knew Don through my husband, who passed away suddenly in 2007. He and Don knew each other through IPMS, and went together to meetings for many years. Don has been a great help to me, trying to sell my husband's extensive model collection. He faithfully came to the Kit Collector shows every 4 months, helping me with prices, checking if the kits were missing any parts, and helping me to be ok with selling things at a discount so I could clear the inventory. His health wasn't good at the last show in March, and he told me he wouldn't be at the July show, since he would be recovering from surgery. I was shocked to find out he had passed away in April, but glad that he was in Heaven with his Lord and Savior, and is now in perfect health! I look forward to seeing him there in the future. Thank you, and God's blessings to you! One of Don's long-time, prize possessions, "1953 Ford Victoria with a '54 front end" as he described it. These are the pictures from our Uncle Don's Attic booth in Jamestown, CA. Jesse, my son (in the photos), learned his love of modeling and all things Train, Plane and Automobile from his Uncle Don. He loves to hang out down there when he can to talk about these things close to his heart. Don was a part of both our son and daughter's growing years into adulthood and was always supportive. He will ever be a part of them both. "He was a good guy with a smile on his face and in his heart." Dawn Yonally, Ph.D.
Pastor Shawn Mandoli, presiding Minister for the service. and saying how the deceased affected their lives as I have seen here today." 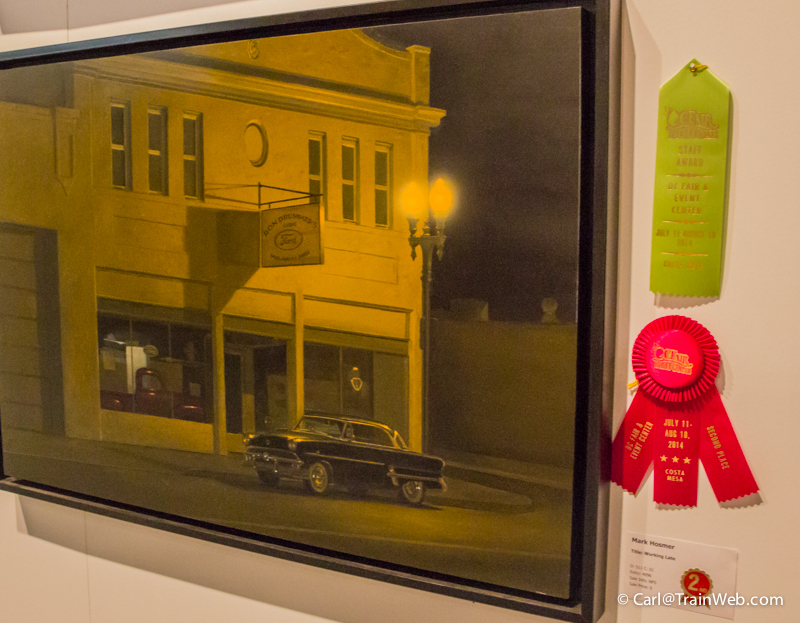 Painting by Mark Hosmer, commissioned by Don, of Don's '53 Ford. Note the name on the business sign. Thanks to all for attending Don's Memorial Service. Many of you traveled great distances and it is appreciated. Thank you especially to the Hosmer family for their planning of the service and the food and fellowship afterward. Thank you to Michael Manning for his Musical Tribute. Thanks to Pastor Shawn and Crystal-Gayle Mandoli and the sound man for their input as well. As someone said at the service, we all felt Don was part of our families, but in reality we all were part of his. Earlier this AM, I was having a discussion with my girlfriend about light economics (before coffee) and mentioned there were great teachers throughout my schooling that got me where I am today. It was at that point thoughts brought me back to elementary through graduate school thinking of my favorite instructors. One of the greats was Mr. Don Drummer and he was in my thoughts today. A few stories I remember from Ball Jr. High School (Somewhere between 1976-1978) in perhaps 7th or 8th grade where Mr. Drummer was our Drafting instructor. There were times in class when Mr. Drummer would display his being very upset, raise his voice and then storm out of the classroom. Soon thereafter, he would walk right back in and jokingly say to everyone, first pausing to add tension to the air, then note - "have a nice weekend"! Of course, he wasn't really upset and it was an act - or better yet, great acting! Another time, we had a student that had gone overboard with some drugs - literally, pills were coming out of his pocket and on to the drafting table. Mr. Drummer handled the situation like a true professional, walking the student away to I imagine the nurse station, but then telling all of us something along the lines of "we're all human and sometimes we make mistakes - let's hope it works out for him." I believe Mr. Drummer also ran for office once in Anaheim. Perhaps it was city commission or something like that. He would bring his Don Drummer for X placards into the office and encourage all of us to get our parents to vote for him! Finally, in looking through this wonderful remembrance web page, I noticed I have something in common with one of Don's friends, attending Helix High School in La Mesa, CA! Look me up in Vero Beach, Florida should your travels ever take you over to the Treasure Coast. Rest in Peace, Don Drummer. Don was standing by my side when I took this photo December 5, 2004. We were attending Nevada Northern Railway's "Steam in Winter" with Don Roe and Chris Guenzler. It was the greatest photo safari I have ever been on because it was with my friend and colleague, Don Drummer. I imagine Don looking down on us now from Heaven and waving his appreciation, in his understated way, for all the Hosmer's are doing to make sense of all his affairs and possessions. 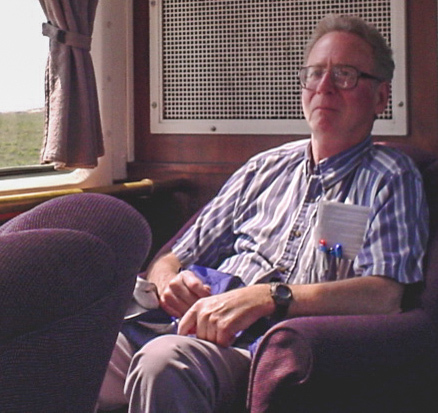 (This photo of Don was taken May, 2006 when he and I were on an Amtrak Coast Starlight trip to Seattle. He was in the Pacific Parlour Car, second level, and I was standing on the Los Angeles Union Station platform.